I've got us at 9-3. Losses to LSU, Boise and either SDSU or Fresno. Fresno lost a lot of production this year. I expect a small drop for them. SDSU just isn't that intimidating as they were a couple years ago (they could easily jump back up.) I also love that we have a bye before SDSU. I don't love that its that early in the season but I like that it is pre-SDSU. We will have a good shot at Boise but I am not confident that we can steal it. BYU-Provo is going to be beaten, bruised and broken by the time we get them. I wouldn't be shocked if they were 0-7 coming in to Logan. However I expect them to be 2-5. We've got a great shot at breaking their back. Wake Forest is probably our 5th toughest game. I don't feel super confident here. However, with a new coaching staff, they won't have a lot to scout us off of. Look at how BYU-Provo beat Arizona last year because Zona wasn't prepared for their offense. CSU, AF, Wyoming, and Nevada aren't going to be easy but we should be fine. New Mexico should be a cake walk. I'm hoping that we start pulling students out of the stands for Stony Brook. Exactly! It all has to do with sample size. Yeah, Wilson had some good games, but he has not played enough games that anyone can say if he is a world beater or not. Right now, he reminds me of a diluted Hill, with worse wide receivers. BYU will be a one trick pony this year. If you stop Wilson, you will stop BYU. Once teams have had a chance to scout him out, they will continue losing games. Not to mention, he is a running QB. His chances of being healthy all season are slim to none. I honestly don't know why there would be a little brother mentality when it comes to BYU. 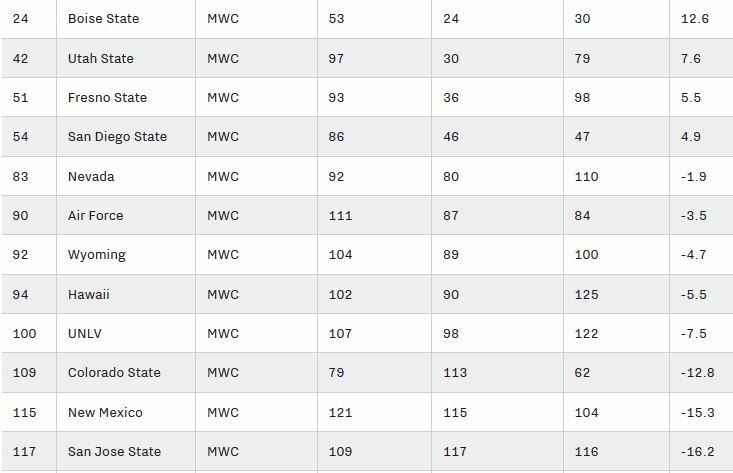 Lets be honest, BYU the last few years would have been the same as a middle of the pack MWC team at best akin to Colorado State, Airforce, Nevada. I see no reason to believe that anything is going to change at that institution in the near future. Their recruits continue to go downhill, their fan base is losing interest, they are losing games they should win, and their coach is really nothing to write home about. I know some of you closet BYU fans have a hard time admitting this, but right now our program is in a much better place than BYU's. Fresno's QB was very integral to their success, he is gone. Boise QB is gone, meanwhile, our QB is back and will be more seasoned than PY. we can beat Wake, ( remember Gary's first game at Auburn?) he will be ready. CSU, BYU at home, edge to us. SDSU is very beatable, tough game however, need the Aztec monkey off our back. Tipa and our D should be very solid, if not scary at times. But, as always with football, line play is key, we shall see what they come up with. I am optimistic. I think the X factor this year is the O-Line. We had a REALLY good front 5 last year that did amazing things in pass protection and did a great job opening up holes in the run game. Edwards is back, which is good. Someone here said Moroni I is also coming back too? But other than that, we have some big shoes to fill. If the O-line can replicate last years production, or come close to it, I predict a 10 to 11 win season. If they struggle, my guess would be a 7 wins. My expectation/benchmark to call it a successful season is 7-5 or 8-4. 6-6 would not be a huge surprise, but would be pretty disappointing. 9-3 or better would be a massive success with that schedule. I am most worried about LSU, Wake, Boise, SDSU, and Fresno (in that order). Admittedly, I am going off of history and am not well informed with what Boise, SDSU, and Fresno actually have coming back. While I mostly think Gary is back in his element and will knock it out of the park, I do have moments where I worry about how things ended at OSU and think there's a chance this could go very badly very quickly if we get off to a slow start. I second this. Ancient history is ancient history. Anything that goes back beyond the current players is of questionable relevance. Over the last 5 seasons, we're 3-2 against BYU-Provo, with an aggregate score of 158-143. Reasonably evenly matched, with a slight advantage to us, and the trend in our favor. 10-3 Ls to LSU, Fresno and MWCCG on the road @ Fresno. Last edited by taniataylor on February 5th, 2019, 2:33 pm, edited 2 times in total. Stony Brook will be alot better than last year's Tennessee Tech. They won't be as good as 2015 Southern Utah, but closer to them than they are to 2018 Tennessee Tech. Maybe similar to 2016 Weber who we handled fine, though the motivation with the SUU narrow escape the year before made a difference. They did give South Florida a run two years ago. Our starters will have to play more than the first half this time. We might put it away late in the third or early in the fourth and be able to give the 2s some reps. Anyone know why we stopped scheduling in-state(plus Idaho State) FCS opponents? We have Southern Utah in 2020, no other FCS games announced beyond then. I'd imagine we play at least Idaho State. Hartwell has said he will keep the local tie for FCS as long as it counts towards overall standings. There is a movement to shy away from FCS games in FBS. My understanding is the local schools wanted too much money, so we scheduled others instead. Mark it down: Our D is going to be GOOD this year. As in Top D in the conference. Our Offense... will take a step back. It’s going to come down to how well the O-Line steps up. I’m going to take the optimistic view and say 10-2 regular season, Host the MWC championship game against... Hawaii. Yup. Hawaii. We’ll obviously win because they won’t be ready for Logan in December. ... Yup. Hawaii. We’ll obviously win because they won’t be ready for Logan in December. I've heard that before. In the old days, they typically looked more comfortable in the cold than our guys . I agree with your thoughts on the two sides of the ball. Defense if healthy is gonna give people fits. I can see USU, likely going 8-4 or 9-3. I think we go 11-1 with LSU being our loss. I think we lose by 8 or less to them with a chance to put the game into overtime on our last drive. I think we will go 8-4, with losses to Boise, LSU, Wake, and either Fresno/SDSU. I am actually leaning towards changing the Wake game to a win, but for now will consider it a loss. A win in our bowl game, likely against MAC or C-USA competition, will get us to a very respectable 9-4 record.